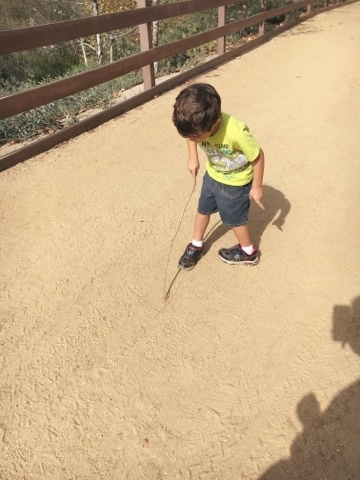 Tiny Toes in SoCal Sand: A Divine Appointment Regarding Learning Styles?! You know what I never gave much thought to as a public school teacher? Learning styles. Let's face it...In a classroom of 34 children, it's impossible to teach to every child's preferred learning style. Of course I did differentiate for those students who really struggled or really excelled, but for the vast majority of the students, I chose the learning style that fit most of them and was the easiest to implement in a public elementary classroom. There isn't anything wrong with this. But...How fortunate homeschoolers are for having parents who can cater to their learning style?! Imagine the deep love of learning that can be fostered through this! Two days ago God set up a meeting for me at Hobby Lobby. I walked in and saw a lady from my bible study looking through the devotional set up at the front of the store. Really, it almost made me laugh because it couldn't have been a more divine appointment. Anyway, this lady unschools. While God has not called me to that, He sure used her to tell me what He wanted me to hear about teaching my own children. 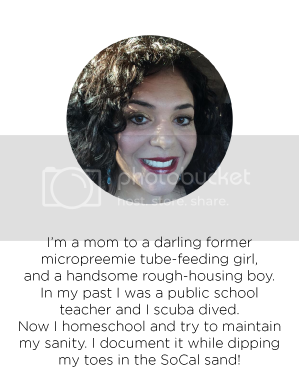 This lady, who has never been a formal teacher (but who has homeschooled for 18 years!) told me that I needed to truly watch how Strong B wants to learn. Tiny B is very structured and can sit and learn for long amounts of time. She is very eager to please me. Strong B is 4 years-old. And a boy. And at this point in his life doesn't want to sit for 2-3 hours a day like Tiny B does to learn. He wants to climb trees and use sticks to draw letters. He loooooves reading but he doesn't want to do tons of formal activities with it. And he shouldn't have to, because he's 4! I told my husband that God had truly put it on my heart to teach him in a way to grow his love of learning that is already present. I'm homeschooling and this is one of its biggest advantages! So I started yesterday. 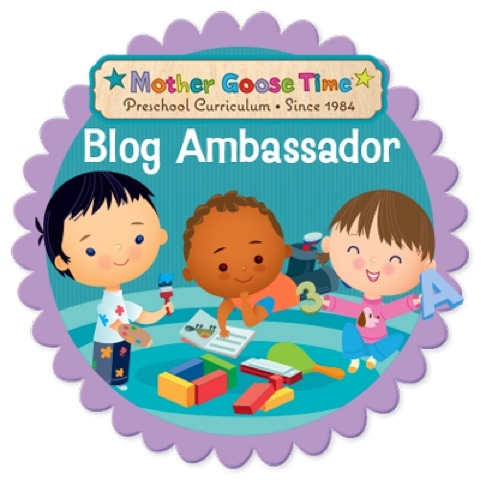 I'm so thankful that with my Mother Goose Time curriculum I can tailor it to their needs. 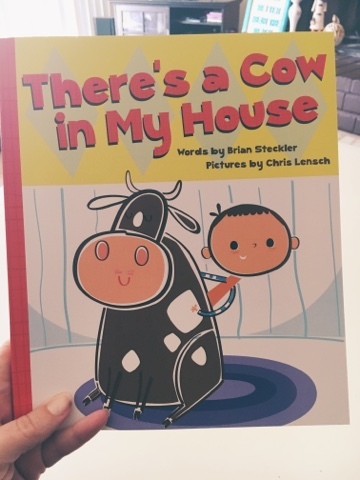 We began yesterday with reading "There's a Cow in My House" which was the book that was included with this month farm theme. We read it and I used my Stopliight Questions to further his understanding. I asked Green light questions which are literal. "Where was the cow sitting?" I asked Yellow questions which are inferential. "Why did the cow do that?" I asked Red questions which are "off the page" questions and apply to their own lives. "If you were the cow, would you do that?" This truly engaged him, and it built upon his reading skills. We keep talking about how he'll be reading soon, and boy is he excited! I love the focus on Literacy in MGT. 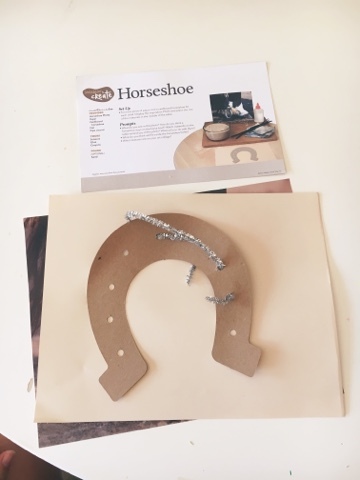 We made a horseshoe after which was a Made to Create activity. He was interested in it but only for a few minutes, which is fine, because that's he learns. Then I took him exploring on a trail. He picked up a stick and I asked him to draw the letters that he knew. He only wanted to draw an "A" because he had things to do, such as pretend he was protecting me from the bad guys. And that was fine. Because he's still learning. And you should have heard our conversation! This guy is smart! He listens so much! I also let him have his first piece of gum. Tiny B was at her charter school on one of the two days a week that she spends there, so today was all about him. I'm loving learning about my children and listening what God has to tell me about them. I hope that I never stop hearing His voice regarding how to teach my children. It's beautiful.